BBFC Consumer Advice:Mild bad language, violence. STROBE LIGHT WARNING: INCREDIBLES 2 contains several sequences of flashing lights which may affect customers who are susceptible to photosensitive epilepsy or other photo sensitivities. 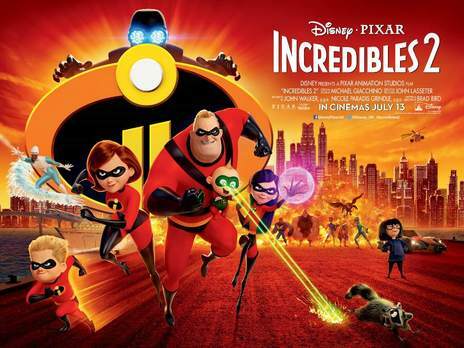 In 'Incredibles 2', Helen (voice of Holly Hunter) is called on to lead a campaign to bring Supers back, while Bob (voice of Craig T. Nelson) navigates the day-to-day heroics of 'normal' life at home with Violet (voice of Sarah Vowell), Dash (voice of Huck Milner) and baby Jack-Jack—whose superpowers are about to be discovered. Their mission is derailed, however, when a new villain emerges with a brilliant and dangerous plot that threatens everything. But the Parrs don't shy away from a challenge, especially with Frozone (voice of Samuel L. Jackson) by their side. That's what makes this family so Incredible. INCREDIBLES 2 contains several sequences of flashing lights which may affect customers who are susceptible to photosensitive epilepsy or other photo sensitivities.